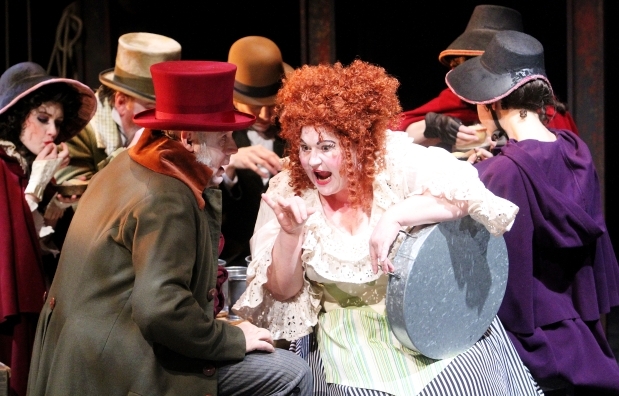 Elizabeth Stepkowski-Tarhan is sensational in the role of Mrs. Lovett. While it’s true that desire lies at the core of what it means to be human, uncontrolled desire can lead to deadly obsession. Vertigo Theatre’s final production of the 2011/2012 season, Sweeney Todd – The Demon Barber of Fleet Street tells the story of a man who allows his appetite for revenge to turn into a deep, dark obsession that leads to a bloody human massacre. The plot centres on the return of Benjamin Barker to his old neighbourhood of Fleet Street in mid 19th century London. Barker had been convicted on false charges and sent to live in a prison colony in Australia. He manages to escape and make his way back home, determined to get his family back and to bestow revenge on those who had ruined his life. Barker changes his name to Sweeney Todd and with the help of pie chef Mrs. Lovett, the two embark on a plan that leads to a dark and twisted tale of events. Originally presented on Broadway in 1979, Sweeny Todd garnered eight Tony Awards, including the award for best musical of the year. The production was directed by Harold Prince and featured a musical score by Stephen Sondheim. Both Angela Landsbury and Victor Garber were amongst the renowned original cast. Since then, the show has seen a number of notable revivals, including an inventive 2005 Broadway revival that starred Patti LuPone. Vertigo’s production of Sweeney Todd, directed by Mark Bellamy in his final season as the company’s artistic director, effectively captures the eerieness of Harold Prince's original broadway production. Bellamy capitalized on the intimate atmosphere of the Playhouse, staging the show to bring the story to life in a way that was engaging and at times very real and frightening. Sweeny Todd is a difficult show to stage – the sheer logistics of the show requires great attention to detail, as it involves elements like trap doors, a shaving competition and piles of human bodies flying around. Thankfully, Bellamy’s production displays meticulous attention to these details; combined with strong cast performances and exceptional creative design elements, this production is indeed impressive. Narda Mccarroll’s scenic and lighting designs, and Deitra Kalyn’s costume designs brilliantly transports the audience to Victorian era London. Maccaroll’s versatile set effectively serves as a convincing setting for the streets of London, in addition to a variety of other locations throughout the show. Kevin Aichele’s portrayal of Sweeney Todd is first rate. His tall stature, strong vocal delivery and powerful presence produces a chilling and frighteningly convincing portrayal of a man so scorned and wronged in life that he turns to reckless murder. Along with Elizabeth Stepkowski-Tarhan’s likeable portrayal of Mrs. Lovett, it was thrilling to see the infamously twisted characters of Todd and Lovett come alive on the Playhouse stage. Mrs. Lovett and Sweeney Todd (Kevin Aichele) bring the show's INFAMOUSLY twisted characters alive on stage. As Anthony and Johanna, the young couple in the show’s subplot, Scott Shpeley and Allison Lynch both give refreshingly sweet performances. However, I suspect that a lot of Shpeley’s music was transposed to meet his lower vocal range. I was disappointed with his rendition of my favourite song from the show, Johanna, for this reason. At times, his singing sounded unnaturally low and did not blend well with the other actors onstage. Lynch on the other hand pleasantly surprised me. As 15-year-old Johanna, Lynch is extremely convincing in her body language, the way she carries herself, her vocal delivery and overall characterization. On the other side of the coin, Scott Olynek’s performance in the role of Tobias is indeed an epic fail. The character of Tobias is a young adolescent male. Directors have some leeway in deciding how old they want this character to be. Sometimes he’s in his late teens; in Tim Burton’s film version, Tobias looks like he is around 12-years-old. Olynek looks far too old for the role. I appreciate the fact that he tries his best to act like a young boy, but unfortunately his manly appearance results in his Tobias coming off as an adult male with mental disabilities. Maybe this was Bellamy’s intention? Even if it was, the end result is confusion about whether this production’s Tobias is a mentally disabled adult, or a man trying desperately to play a 12-year-old boy. Reid Spencer offers a chilling performance in the role of Judge Turpin, the character responsible for wrongfully convicting Sweeney Todd and sending him to prison in Australia. A strong ensemble, all of which are excellent at portraying a variety of different characters, round out the rest of the cast. Props go out to Katherine Fadum, who never ceases to impress me with the versatility of roles she portrays. Although I acknowledge how Bellamy may have felt that sound amplification (having the actors wear microphones) may have been unnecessary in such an intimate presentation space, the production suffers immensely because of this. Why? Because Stephen Sondheim wrote the score. Sondheim’s work is beautiful – his scores are sophisticated and masterfully written…but also renowned for the wordiness and intricacies of their lyrics. The detailed nature of his lyrics require complete understanding from its audiences, as they often contain important information integral to the plot. Sweeney Todd's director, mark Bellamy. The absence of amplification in Bellamy’s production make the lyrics very difficult to hear at times from the back of the Playhouse and left many of the senior citizens (who comprise a large percentage of the theatre community) whom I sat beside, frustrated. In addition, while Lynch’s soprano voice is exquisite, the absence of amplification often made it impossible to hear what she was singing about. Microphoning actors is more than just ensuring voices are heard. It also allows the sound operator to effectively mix the vocals with the orchestra to optimize sound quality – something this production could have greatly benefited from. One aspect of the show leaves me utterly baffled. As the audience was filtering into the theatre before the show started, there was an odd looking display on stage – it looked like the figure of a man hanging upside down over top of a bucket. Once the show began, a couple of actors proceeded to whisk it away within the first moments of the opening number; the peculiar setup was never explained. Despite some of the odd choices made for this, Vertigo’s Sweeney Todd captures the dark spirit of the musical and offers some outstanding performances. As Bellamy stated in the playbill, “at its heart, Sweeney Todd is a play about obsession – every character has something that they obsess over – a person, love, money, prestige, power, revenge – the drive of these obsessions fuels the play and all of it’s characters.” While the story of Sweeney Todd involves rare and extreme cases of out-of-control obsessions, it makes us question where we draw the line when it comes to justice and selfishness, compelling us to realize that no matter how honourable or dishonourable our intentions are, we are always responsible for the consequences that ensue.